You know the dilemma. You are craving Italian food, yet at the same time you kind of want Mexican. But, of course, everybody always loves avocados. What do you do? Make Guacamole Italiano! 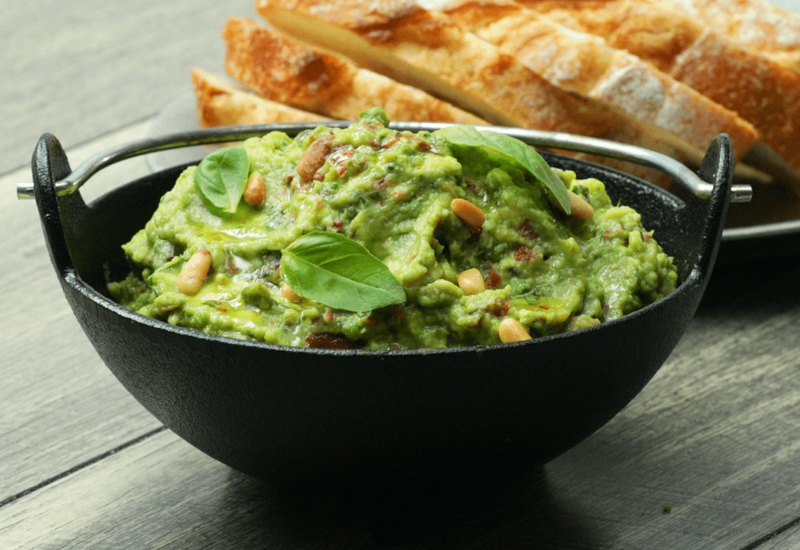 Let the versatility of a perfectly ripe avocado shine through in this Italian spin on guacamole. It features sun-dried tomatoes, basil, and toasted pine nuts. Instead of traditional corn chips, try serving this guacamole with toasted bread instead. Ciabatta works great! Reserve small portions of the tomatoes, pine nuts, and basil for use as garnish. If you have a favorite high-quality olive oil on hand, drizzle a tablespoon or two over this guacamole, as well. Serve with chips, pita chips, or fresh veggies. Per Serving: 103 calories; 9g fat; 5.4g carbohydrates; 1g protein; 0mg cholesterol; 139mg sodium. Love this Italian Mexican fusion guac. The basil gives it incredible flavor. I also like the pine nuts for added crunch. Perfect dip for veggies. Really good Italian inspired guacamole! I spread this on bread, but if you want to cut carbs I recommend fresh veggies. Delicious flavor. Delicious Italian guacamole, really good flavors. Impressive! This was good, for some reason it just works! The lime juice flavor through me off a little bit with the basil, so next time I will omit or adjust that amount.